Download "PUBLIC HEALTH NURSE II"
1 PUBLIC HEALTH NURSE II DEFINITION To plan and direct a specific public health program; to provide public health nursing services to individual clients and the community at large through the provision of clinical services and counseling and through the promotion of community health and welfare; to supervise and evaluate the work of subordinate staff as assigned; and to perform related duties and responsibilities as required. SUPERVISION RECEIVED AND EXERCISED Receives direction from the County Health Officer. 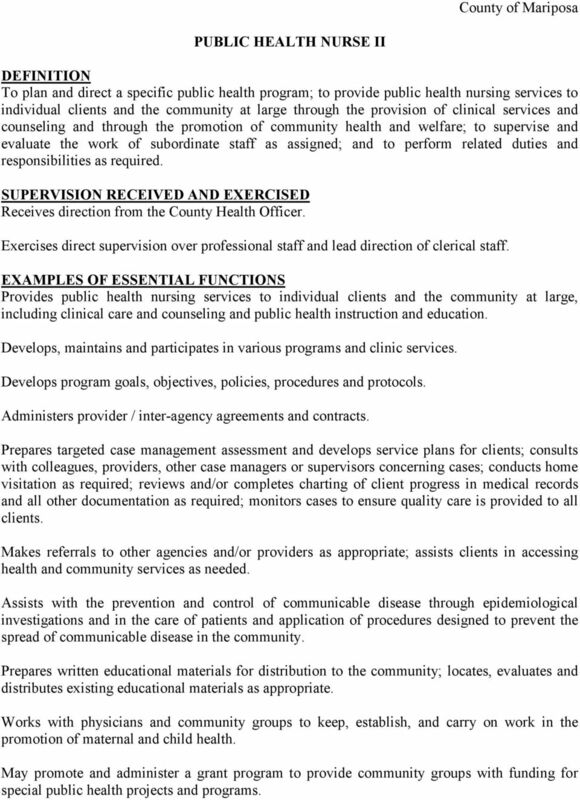 Exercises direct supervision over professional staff and lead direction of clerical staff. EXAMPLES OF ESSENTIAL FUNCTIONS Provides public health nursing services to individual clients and the community at large, including clinical care and counseling and public health instruction and education. Develops, maintains and participates in various programs and clinic services. Develops program goals, objectives, policies, procedures and protocols. Administers provider / inter-agency agreements and contracts. Prepares targeted case management assessment and develops service plans for clients; consults with colleagues, providers, other case managers or supervisors concerning cases; conducts home visitation as required; reviews and/or completes charting of client progress in medical records and all other documentation as required; monitors cases to ensure quality care is provided to all clients. Makes referrals to other agencies and/or providers as appropriate; assists clients in accessing health and community services as needed. Assists with the prevention and control of communicable disease through epidemiological investigations and in the care of patients and application of procedures designed to prevent the spread of communicable disease in the community. Prepares written educational materials for distribution to the community; locates, evaluates and distributes existing educational materials as appropriate. Works with physicians and community groups to keep, establish, and carry on work in the promotion of maternal and child health. May promote and administer a grant program to provide community groups with funding for special public health projects and programs. 2 Page 2 Participates in conferences, task forces and meetings, and confers with public health administrators and others on community public health problems. Attends civic and other community meetings and events to explain and promote the activities and functions of the program and to establish favorable public relations; gives public speaking presentations as requested; prepares publicity materials for distribution; oversees and/or participates in community events as appropriate. Coordinates and/or participates in special programs and projects as assigned. Supervises and evaluates the work of professional staff and provides direction of clerical staff as assigned; provides or coordinates staff training; offers advice and assistance as needed; implements disciplinary measures as appropriate. Reviews and evaluates reports of subordinates for accuracy, completeness and compliance with departmental policies and procedures; determines and monitors follow-up actions required. 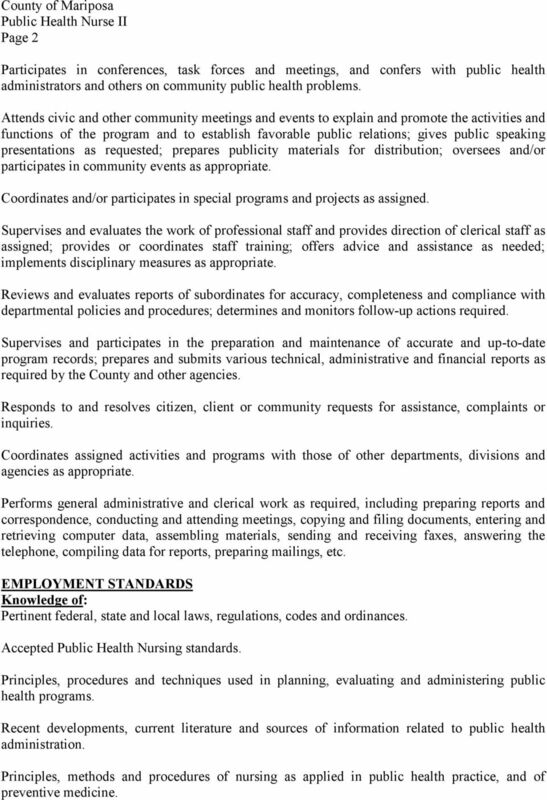 Supervises and participates in the preparation and maintenance of accurate and up-to-date program records; prepares and submits various technical, administrative and financial reports as required by the County and other agencies. Responds to and resolves citizen, client or community requests for assistance, complaints or inquiries. Coordinates assigned activities and programs with those of other departments, divisions and agencies as appropriate. Performs general administrative and clerical work as required, including preparing reports and correspondence, conducting and attending meetings, copying and filing documents, entering and retrieving computer data, assembling materials, sending and receiving faxes, answering the telephone, compiling data for reports, preparing mailings, etc. EMPLOYMENT STANDARDS Knowledge of: Pertinent federal, state and local laws, regulations, codes and ordinances. 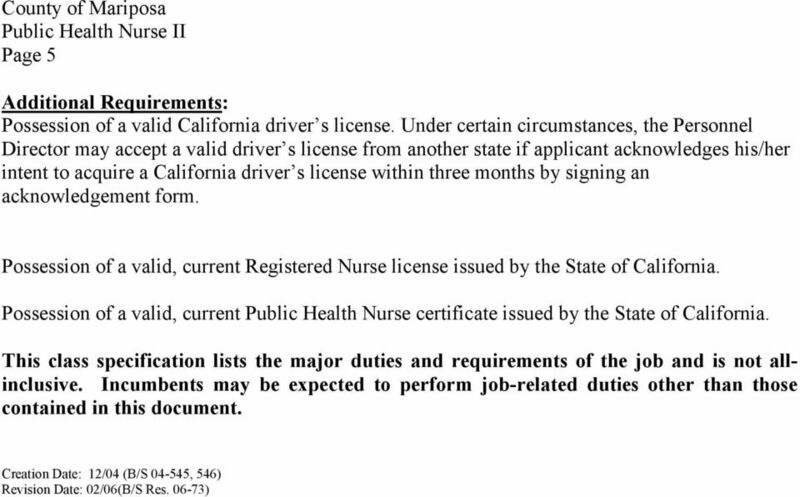 Accepted Public Health Nursing standards. Principles, procedures and techniques used in planning, evaluating and administering public health programs. Recent developments, current literature and sources of information related to public health administration. Principles, methods and procedures of nursing as applied in public health practice, and of preventive medicine. 3 Page 3 Principles, practices and current issues in health education, including mental health, substance abuse, maternal and child health, and general public health. Basic causes and types of treatment for substance abuse, mental health disorders and public health issues. Sociological, cultural, environmental and economic factors affecting individual and public health. Causes, means of transmission, and methods of controlling communicable diseases. Interviewing and counseling practices and techniques. Principles, techniques and materials used in public education. Principles of supervision, training and performance evaluation. Budget preparation and administration practices. Report and business letter preparation techniques. Modern office practices and technology, including the use of computers for data processing and records management. English usage, spelling, grammar and punctuation. Safe work practices. Public / community relations techniques. Ability to: Interpret, analyze and apply federal, state and local laws, rules, regulations, codes and ordinances. 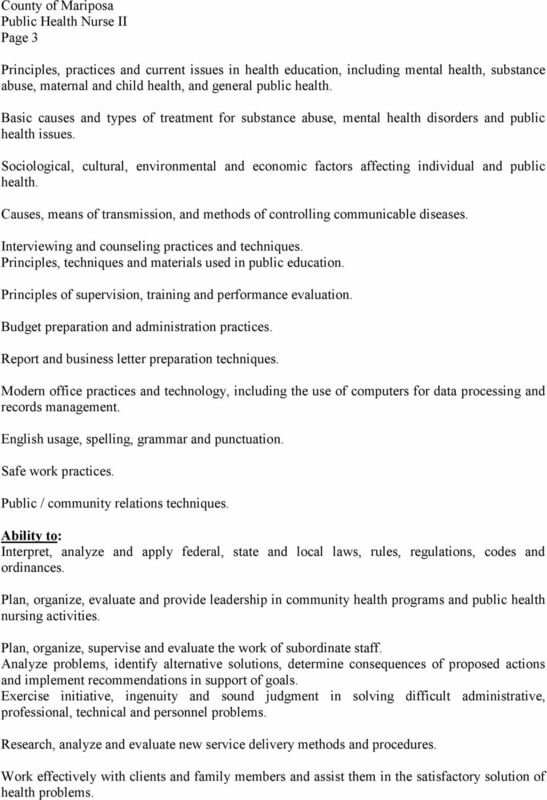 Plan, organize, evaluate and provide leadership in community health programs and public health nursing activities. Plan, organize, supervise and evaluate the work of subordinate staff. Analyze problems, identify alternative solutions, determine consequences of proposed actions and implement recommendations in support of goals. Exercise initiative, ingenuity and sound judgment in solving difficult administrative, professional, technical and personnel problems. Research, analyze and evaluate new service delivery methods and procedures. Work effectively with clients and family members and assist them in the satisfactory solution of health problems. 4 Page 4 Research and prepare effective public education and information materials. React quickly and calmly in emergency situations. Prepare clear and concise administrative, financial and technical reports. Perform mathematical computations with accuracy. Make effective public presentations. Gain cooperation through discussion and persuasion. Communicate clearly and concisely, both orally and in writing. Establish and maintain effective working relationships with those contacted in the course of work. TYPICAL WORKING CONDITIONS Work is performed in an office and clinic environment. Incumbent drives on surface streets and may be exposed to traffic hazards, adverse weather conditions, temperature extremes, wetness, communicable disease, pathogenic substances, odors, skin irritants. TYPICAL PHYSICAL REQUIREMENTS Requires the mobility to work in an office and clinic environment. Requires the ability to sit at desk for long periods of time and intermittently walk, stand, run, climb, balance, bend, squat, twist and reach while performing office and/or clinical duties; operate motor vehicles; lift and/or move light to moderately heavy weights; perform simple grasping and fine manipulation. Must be able to maintain effective audio-visual discrimination and perception needed for making observations, communicating with others, reading and writing, and operating office and medical equipment. 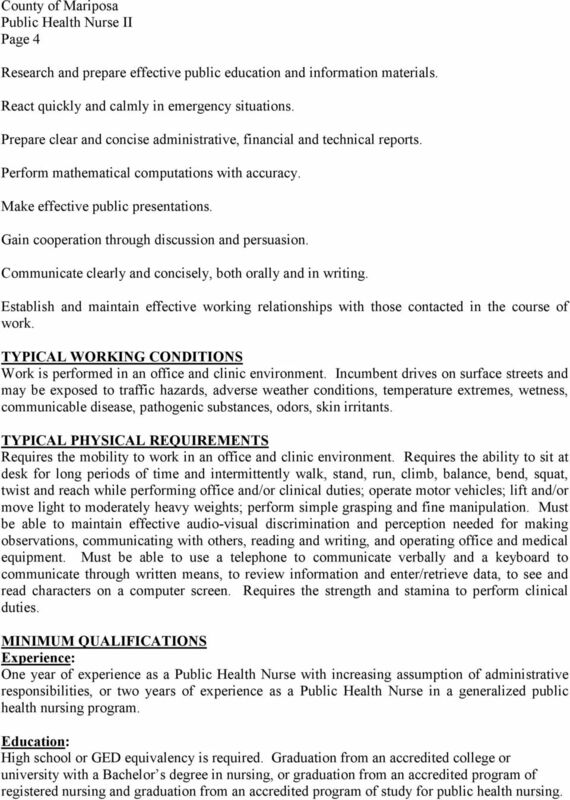 Must be able to use a telephone to communicate verbally and a keyboard to communicate through written means, to review information and enter/retrieve data, to see and read characters on a computer screen. Requires the strength and stamina to perform clinical duties. MINIMUM QUALIFICATIONS Experience: One year of experience as a Public Health Nurse with increasing assumption of administrative responsibilities, or two years of experience as a Public Health Nurse in a generalized public health nursing program. Education: High school or GED equivalency is required. Graduation from an accredited college or university with a Bachelor s degree in nursing, or graduation from an accredited program of registered nursing and graduation from an accredited program of study for public health nursing. CITY OF ROSEVILLE ENGINEERING TECHNICIAN I ENGINEERING TECHNICIAN II DEFINITION To perform a variety of technical office and field work involving drafting, surveying, mapping, and related engineering activities. PUBLIC HEALTH NURSE. Identifies health needs in the community and creates and facilitates programs.